It was my sixth visit to the mythical world of earth. Nsibidi and i had always flown together to earth but that day i had decided to fly alone. I wanted to visit my new earth friend, Myra. Myra lived in the Southernmost watery region of earth, in a little town called Cali and she was two years older than i was. Myra was a dada too, an earth dada girl. But there on earth being dada wasn’t seen as outlandish. No one teased them. Unlike in my planet Ginen, where dadas were treated like pox. Earth dada people couldn’t fly but like all dadas, were wise and excelled in whatever skill they acquired. Earth dada people had strange colourful eyes which when looked into, could make one tell the truth and do their biddings. Legend had it that every 500 years, a special earth dada child who possessed the special earth dada gift would be born — The gift of wishing things into reality — and Myra’s wishes always came true. Myra and i had met by a lake side garden a few months earlier. I had flown to earth with Nsibidi to enjoy a few moments away from my planet Ginen. I was admiring a garden-lily when i noticed Myra sitting in a spot. My instincts told me to go sit beside her. She sat on the grass, cross-legged, intently observing a rare garden rabbit. I quietly sat down by her side curiously looking at the rabbit to figure out why she was engrossed in it. ‘What strange clothes you have one.’ She spoke first. Her eyes were gold like the colour of the dying sun. ‘You aren’t from around here.’ She smiled as she looked at my dadalocks. The vines had given me away. ‘Yes… No, I’m from the planet of Ginen.’ I replied, half shy. ‘I’m Myra and you must be Zahrah.’ She giggled lightly. Myra could also speak to, and understand nature. For a long time, Myra had wanted to visit my planet but her inability to fly prevented her from coming and she was too heavy for me to fly with her. Something queer occurred the day i visited Myra. As i landed by her window, a strange wind almost knocked me off my feet. It kept on pulling me towards Myra’s window and it was strange how a windseeker like myself couldn’t control it. The more i tried to resist it, the stronger it pulled. ‘Hello!’ Myra beamed as she appeared from a corner of her house. The wind stopping almost immediately. ‘The grass told me you were here.’ She smiled. ‘Oh yes! So wassup?’ I responded in the earthish slang she had taught me on my last visit, feigning an ‘everything is okay’ smile. We climbed into her room through the window as it was low. Her room was painted green. There were floral paintings, pictures of animals, trees and the sea on the walls. I could see the glow-lily hand lamp which i gave to her on her bedsid table. She obviously treated it with so much care. She was a nature lover. It was late noon and i decided to travel back to my world if i were to make it before dark. As we stepped out through her window, the strange wind came again with an even greater force. This time around lifting me off the ground, i couldn’t fight it, it was strong. Myra tried to hold my hands to keep me down but she too was lifted off the ground. ‘Oh the waters! We’re flying! Look Zahrah I’m flying!’ Myra shrieked with excitement. That was when it hit me! Myra was a special earth dada girl. One way or the other her wishes always came true and the strange wind was as a result of her wish to visit my world. My instincts warned against flying with Myra. I was sure her instincts kicked against it too, but the excitement of leaving earth to ginen was great and the wind kept pulling us. 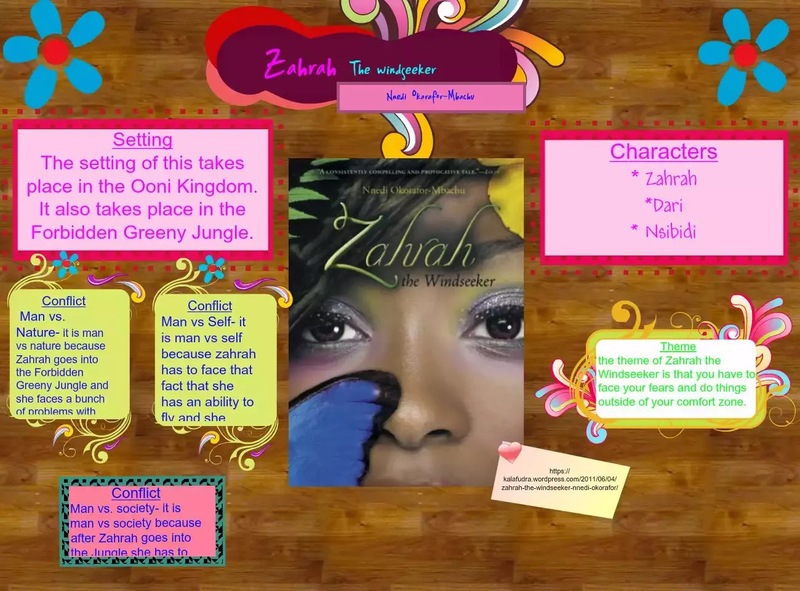 As we flew over the forbidden greeny jungle, Myra’s eyes glowed even brighter. It must have been a magical effect which ginen had on earthlings. Myra took cursory gazes at many things. There was a lot to see. We watched the bush cows from up a huge branch struggle amongst themselves. Myra threw blue spotty mangoes at a transparent chameleon nearby and watched it turn blue. There were flying baby rainbow monkeys up in the sky that day. Myra tried to pet one but it bit her finger with its toothless mouth. Soon, she began to complain of a slight headache, then she slumped right in the air. The strange wind stopped pulling us and we crashed through the air into the gorillas path. I tried to pull her up. To fly her back but all proved in vain. She was breathing heavily. Her chest heaving up and down. With all the strength left in me, i began to pull her towards the gorilla village which was only a few miles away. On nearing the village, some gorrila warriors spotted us and came to the rescue. The first placed Myra on his strong hairy shoulders and headed back to the village while the rest stayed back to look out for hideous jungle creatures that might have been following us behind to eat us. Myra was taken straight to Misty’s hut. I was scared. I blamed myself. Myra would be the second friend whom i had endangered. The first being Dari. A calm voice asked. Rousing me from my deep thoughts. ‘E-earth.’ I managed to mutter loud enough for her to hear. She sighed and began to walk away. ‘Why? Tell me what it is!’ I asked. Why did everything have to be forbidden. I was tired of having to put up with all the forbidden rules of my world. I sat with my back against a Kukala tree. My face, buried in my hands. My body ached from pulling Myra. I was hungry and thirsty and my clothes were all dirty. I looked up at Misty with watery eyes. A ray of hope slowly began to creep into my heart. ‘We need seven seeds from five sunflowers to restore her health. The seeds cannot make her survive here forever, but it will buy her some time in our world. ‘Where can i find it?’ I asked. I didn’t know what a sunflower looked like or where i could find it on earth. All I knew was that i was on a mission to save Myra’s life. There, another adventure began. Previous articleSomething I learned from MTV Shuga Next article Why are we so afraid of talking about some issues?